If you’ve always struggled with making a salad to go with your meal, you must try this Easiest Salad That Goes With Everything! It’s so simple, but can be paired with most meals. I had to share this incredibly easy salad with you all because it literally goes with every meal! It’s truly nothing new, but I wanted to share because I recently realized that it goes with so many meals and it’s made my life easier in the vegetable salad area. Here’s the deal… I like to cook meals when I entertain, but I literally always forget the salad. I just don’t like making a salad and it feels like a hassle, but then I hate not serving any greens to guests. I love eating fancy salads when we’re out, but I rarely make them at home. By the time the main dish is ready and I want to serve it, I pretty much just forget about the salad! So…. I realized I’ve been gravitating to this super easy arugula salad and how it actually goes with everything. It’s made my life easier! I’ve made it for brunch several times and served it with frittata, waffles bacon and creme fraiche. I’ve also made it with pot roast, pasta, lobster rolls, risotto, meatballs, scallops… you name it! It literally goes with everything and it’s the best darn three ingredient salad ever. 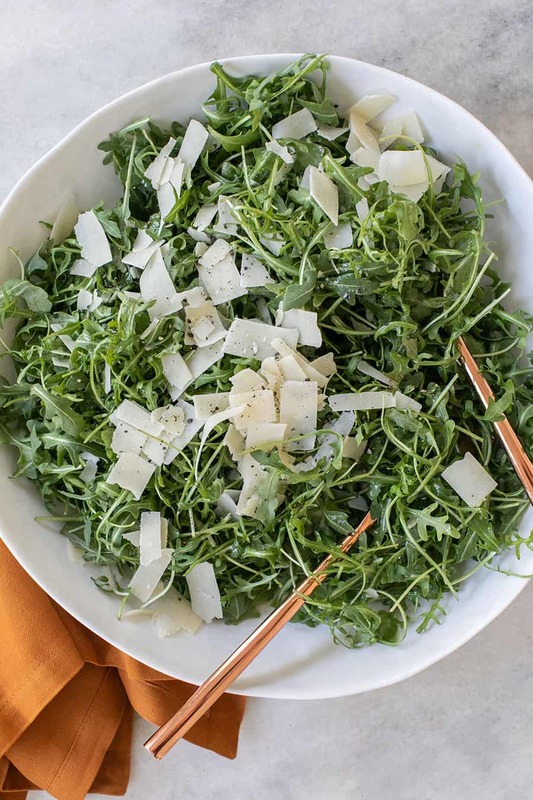 It’s as easy as, pouring a bag of pre-washed arugula in a bowl, adding the two-ingredient dressing over the arugula and then topping it with shaved parmesan and cracked pepper. There is no chopping or extra vegetable washing. That is it my friends. You can make this no-fuss salad as a side dish with any of your main dishes. Arugula has a lot of health benefits too, so you feel good eating it. It’s in the same family as broccoli, cauliflower and cabbage. It also cleanses and detoxifies the body, it’s hydrating and can help you digest food better. 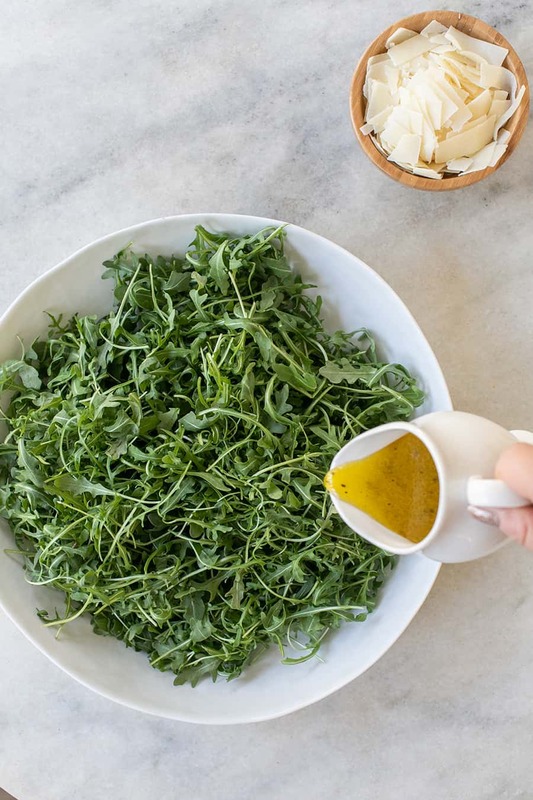 For the dressing (recipe below) I mix a good olive oil with fresh squeezed lemon juice, add a little salt and pepper and pour it over the arugula. I once used a lemon flavored olive oil with the lemon juice and it was so good! 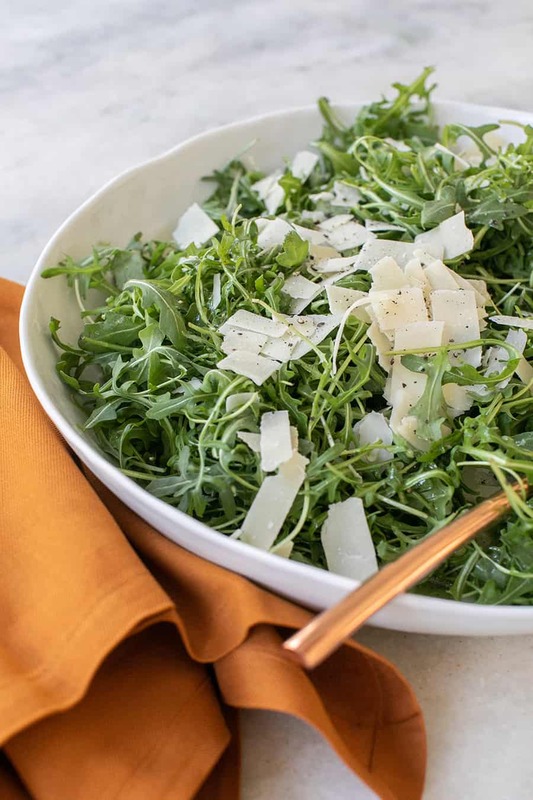 Quick tip – dress the salad right before serving as arugula can lose its crispness quickly. The salad taste fresh with the lemon and olive oil. The arugula has a pepper taste to it and the parmesan adds a little richness. You can buy shaved parmesan at the store, so no need to shave a chunk of parmesan. It also goes with our One Pot Parmesan Risotto nicely! If you’ve always struggled with the salad portion of the meal, I hope this inspires you! 1/4	cup olive oil Regular extra virgin olive oil is good. You can also use a lemon infused olive oil, which is so good! In a bowl, combine the lemon juice, olive oil and salt and pepper. Stir and set aside. 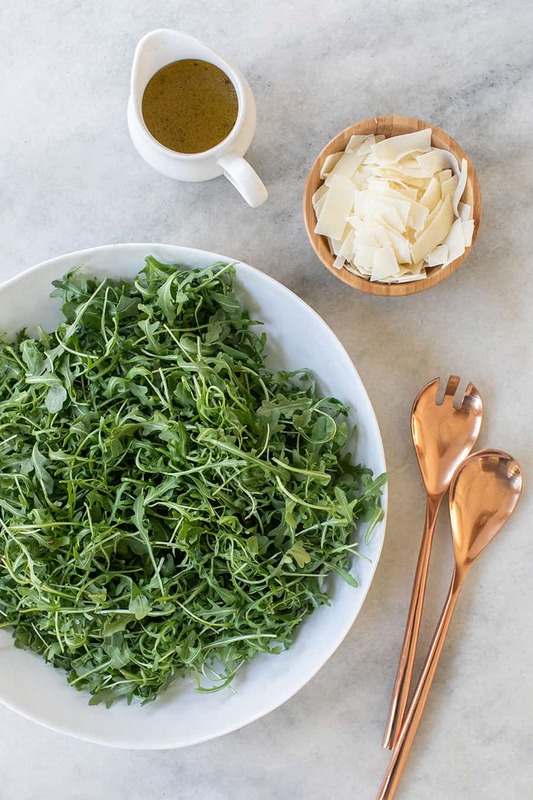 Add the arugula greens in a salad bowl, pour the dress over the top before serving. Toss to coat the greens. Add the cheese over the top.